trusted brand name wire-wrapping pliers, handheld hole punches, gem-setting pliers and more. Choose from economy grade for class kits or for less initial expense when starting out to long-lasting, high-grade pliers every serious jewelry designer needs. Using your gem setting pliers the right way will make the job easier and reduce the risk of marring your stones and settings. 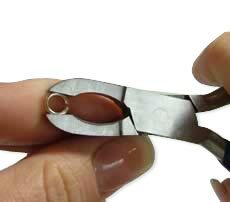 Loop-closing pliers are designed to close open rings, like jumprings. 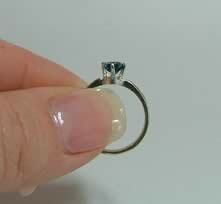 The notch in each half of the jaw holds the ring stable during the process. 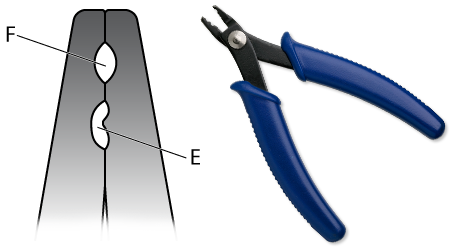 Looking at the closed jaws of the tool you will note the two crimp forming areas: the initial crimping station (E) and the final rounding station (F). See how to create consistent same size loops from jewelry wire with the Wolf Tools® Groovy Looping pliers in this product show-and-tell led by in-house jewelry designer Alice Gershowitz. In-house jewelry designer Esther Pollock demonstrates how versatile the EUROTOOL® Beader's Delight Pliers are for bending, shaping, smoothing and cutting jewelry wire all with one handy jewelry-making tool. Our always-enthusiastic in-house jewelry designer Rose Wingenbach shows you what’s so magical about the UNIVERSAL™ Magical Crimper pliers and how this jewelry-making tool gives strung designs a professional finish.